In the Houston area it will probably rain in the next few days. 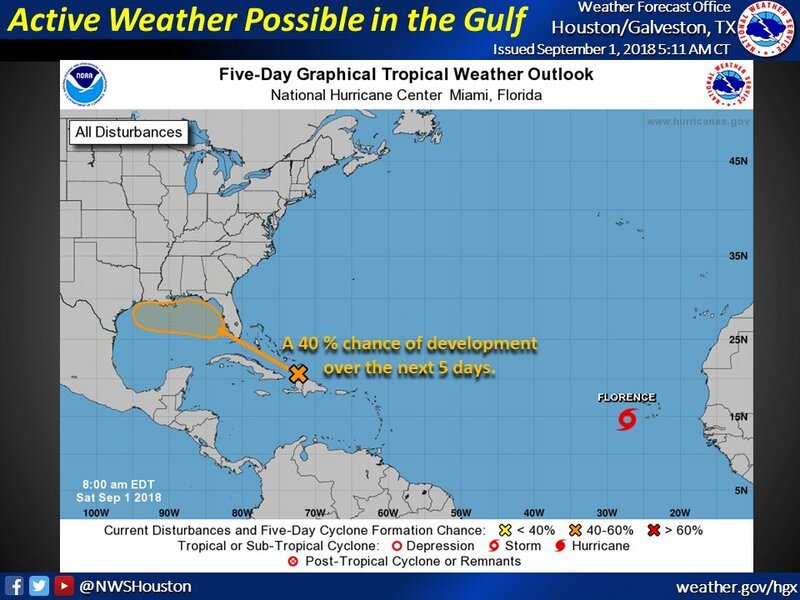 The NWS in Houston predict a rainfall probability of at least 40 percent for the area every day to Friday, with most of the rain coming in the morning. Sunday: Rain showers and rain showers are likely, especially after 8 o'clock Cloudy, high 89. Calm in the southeast at 5 mph in the afternoon. Precipitation probability is 70 percent. New precipitation is possible between a quarter and a half inches. Wednesday: A 50 percent chance of rain and thunderstorms. Partly sunny, with a high 92. Wednesday night: A 50 percent chance of showers and thunderstorms. Mostly cloudy, with lows around 77. Thursday: 40 percent chance of rain and thunderstorms. Partly sunny, with a height close to 91. Thursday night: A 40 percent chance of showers and thunderstorms. Mostly cloudy, with lows around 77. Friday: A 50 percent chance of showers and thunderstorms. Mostly cloudy, with a high Near 91.